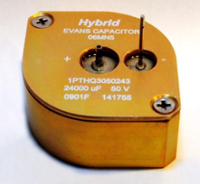 Hermetically sealed Evans Hybrid Capacitors have numerous patented features that provide demonstrated advantages over standard capacitor technologies ! 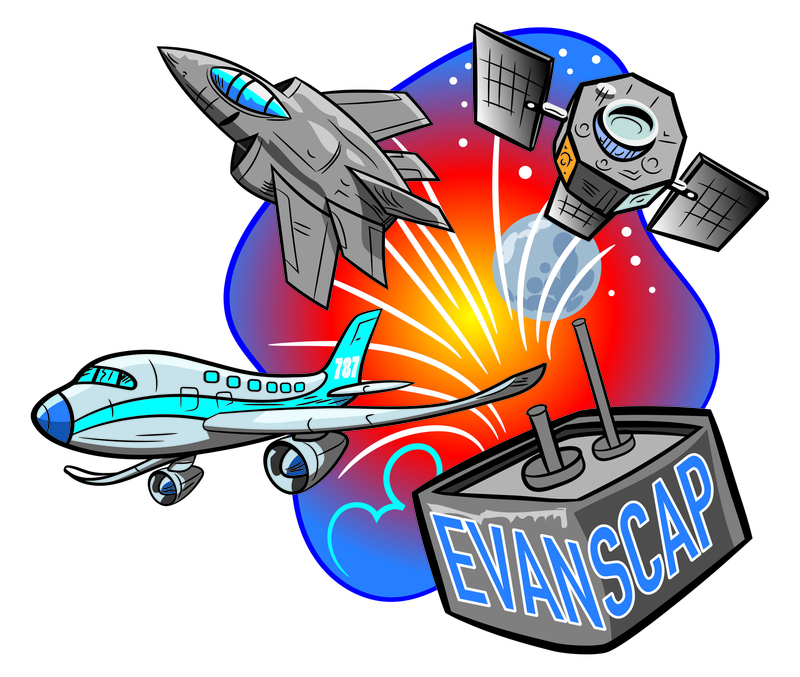 Evans Capacitor manufactures high energy density capacitors for demanding defense and aerospace applications. 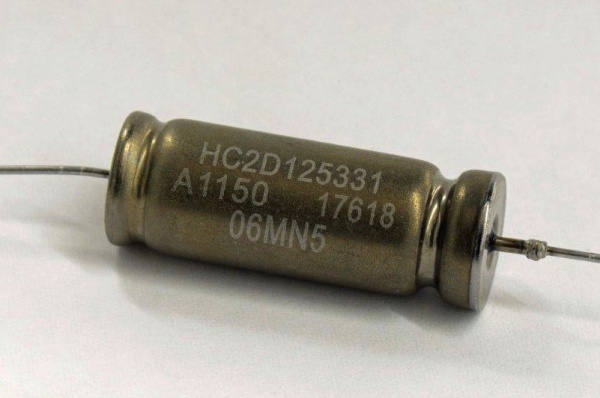 Typical applications replace standard military capacitors, or augment batteries and power supplies where size, weight, reliability and quality are important factors of component selection. and laser applications. With high energy density, Hybrid capacitors are also well suited for bridge power or bus power interruption buffers. The effective series resistance (ESR) of single cell Hybrid Capacitors is much lower compared to other supercapacitors of similar voltage rating. 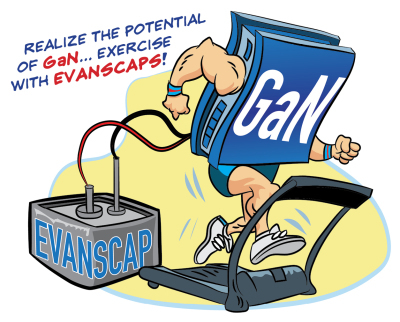 This leads to a very low time constant of 1ms, or less, making Hybrid capacitors well suited for high-rate applications. Operates at higher voltages up to 125 V without the need for series connected cells. "Hybrid Capacitors save weight, volume and cost when compared to other military tantalum wet or aluminum electrolytic capacitors." 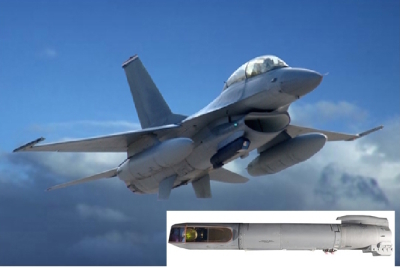 THQ Hybrid Capacitors are perfectly suited for Defense and Aerospace applications requiring high power in a compact, hermetic, tantalum package. Applications include power interruption buffer, filtering and high current pulse generation. Voltage range of 10V to 125V with full operational temperature range of ‐55C to 125C. 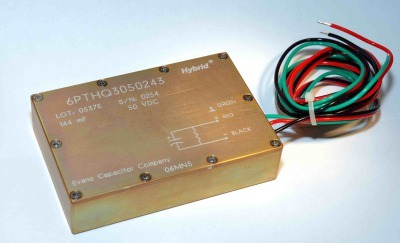 Capacitance values increase from the THQ1 series up to the THQ5 series. THQ Hybrid Capacitors have very high curent capability, unlimited cycle life and environmental ruggedness with MTBF > 5,000,000 hrs. THS3 Hybrid Capacitor with square footprint, provides a 30% increase in capacitance over the standard THQ3 device in the same 0.6" height. 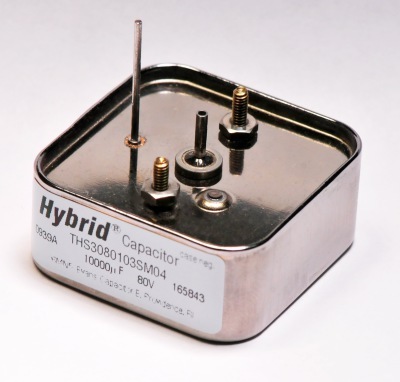 THS3 is perfect for large energy storage needs, where space is at a premium. Proven unlimited cycle life and reliability of MTBF > 5,000,000 hrs. New applications should favor the TDD3 style. TDD series Hybrid Capacitor have the highest power density and highest current capababilty of any Tantalum wet capacitor. Only 0.31" tall for the TDD1 to 0.60" high for the TDD3, makes TDD Hybrid Capacitors perfect for applications requiring high power where space and weight are at a premium. Ultra low ESR and compact construction allows very high current capability and extreme duty cycles. HYCap offers the same proven Hybrid Capacitor technology in the traditional tantalum wet case style. HyCap Series Hybrid Capacitors are available in standard DSCC 93026 and DSCC 10004 ratings, and in newer extended range capacitance ratings. Full temperature range of ‐55C to 125C, with 2,000 hrs life at 125C. 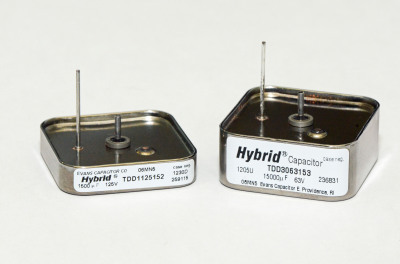 High temperature HyCap Series (HC-HT and HC2-HT) Hybrid Capacitors are for Operation to 200C. Suited for down hole exploration environments, or other high temperature applications, these HT HyCap capacitors are in the industry standard form factor. THQA2 series Hybrid Capacitors offer high power in a compact, hermetic, tantalum package. Applications include power interruption buffer, filtering and high current pulse generation. Full temperature range of ‐55C to 125C. Proven reliability and environmental ruggedness. The THQM2 Configuration provides the THQA2 capacitor assembled into a standard 4 pin mount suitable for automated board level assembly. Pins and leads are pre solder coated with 60/40 Pb/Sn. 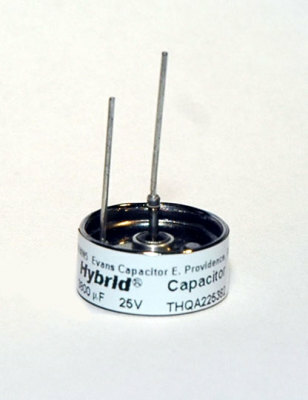 THQA2‐HT Hybrid Capacitors are for Operation to 200C. 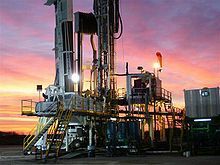 Suited for down hole exploration environments, or other high temperature applications. 1PTHQ3 Series - "Single Pack"
vibration environments, where the capacitor must be clamped in place with considerable force. Capacitor bank with 3 THQ3 series (or 6 THQ3 series) capacitors in series or parallel configuration. Completely wired and sealed in anodized aluminum case, fully potted with epoxy. The capacitor bank assemblies consist of internal THQ capacitors, soldered to a custom designed circuit board, with all necessary balancing resistors, and wiring. The assemblies are then completely sealed and epoxy potted in the rugged anodized aluminum case.